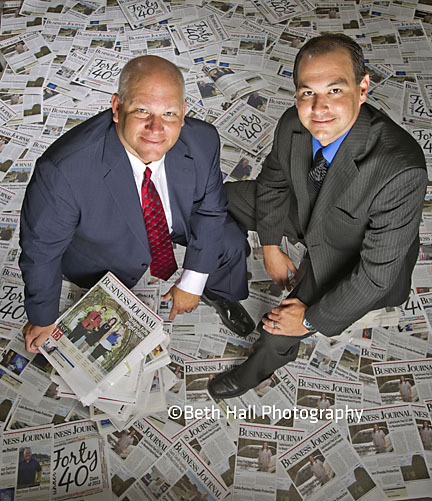 I photograph a lot of the cover photos for the Northwest Arkansas Business Journal, and have for many years now. It’s always a different experience with all of the businesses I encounter, and not every endeavor ends with the most creative photo. Most of the shoots involve offices or boardrooms, so I strive for a nice portrait. I was excited to receive a phone call to photograph the new owner, Darin Gray, and publisher, Rob Gutterridge. Darin became the sole owner of the publication, the first time the magazine has been 100% locally owned since it’s launch in 1997. This announcement was a big deal and I wanted to create an image that would draw attention to their publication. I knew I had the opportunity to be creative b/c newspapers ALWAYS have stacks of papers laying around. I love that the guys were open to my idea, and my mess. We had fun creating this image!